I’m frequently asked how staffing and recruitment providers can fill open job orders when there aren’t enough people to fill them. I answer that question in this episode and also provide specific details for firms of different sizes. As the skills shortage persists, so does the demand for recruiters. The increased demand has put a further strain on an already over-tapped pool of experienced talent. More and more organizations are turning to people without any recruiting experience to stem the shortfalls. Problem is, hiring people without experience can be hit or miss. But some roles consistently transfer exceedingly well. Why? Because of the nature those jobs. And more importantly, the types of people drawn to those professions. In reviewing recruiting teams in 1100 organizations, 6 roles have shown up consistently in producing transferable talent who become great recruiters. Great in how quickly they’ve ramped up, fit in, and gone on to meet or exceed expectations. Does everyone from these 6 roles become a stellar recruiter? Of course not. There are no absolutes, especially in hiring. However, the consistency among these 6 makes them top contenders for your next recruiting hire. The skip tracing skills of commercial collectors help them efficiently research the whereabouts of top talent. Since persistence is the name of the game when collecting debt, they tend to have better than average abilities at following through and staying in touch. Add this to the B2B focus of their work, and you’ve got a potent combination that’s made this a favorite hire of recruiting leaders. You hear lots of “no’s” when selling people on an idea to get them to part with their hard-earned cash. 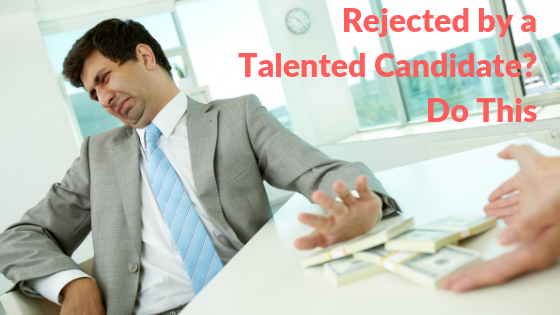 The thick skin of professional fundraisers makes them well prepared for handling rejection and savvy at selling top talent on the idea of parting ways with their current employer. Managers in retail spend long hours and many weekends dealing with difficult customers. The typical weekday schedule in recruiting is a welcome change as they apply their customer service and problem-solving skills. Retail managers are particularly successful in organizations where recruiters spend more of their time in face-to-face meetings with candidates. The fast-paced high-octane environment of a campaign prepares these prospective recruiters with important skills. These include managing competing priorities, dealing with challenging expectations, and achieving difficult deadlines. 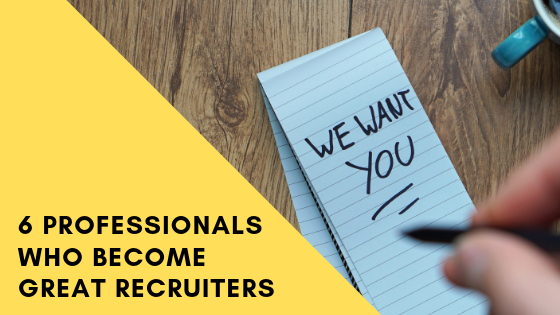 A recruiting opportunity offers them many of the adrenaline filled opportunities without the career interruption that comes at the end of campaign. People from trade associations, chambers of commerce, and other membership organizations often have superior networking skills and extensive contacts. Selling opportunity is second nature as is building rapport. The income potential in recruiting frequently exceeds the compensation ceiling in their current line of work. Recruiting teams seeking people who can create a positive candidate experience over the phone are having success with call center managers. Their background helps them effectively compete for top talent and efficiently make and receive a high volume of calls. As you consider people with these backgrounds take steps to ensure their fitness for the unique needs of your team. Here are three methods that will help. People who come from transferable roles don’t always fit it. The most common reason is culture. Cultural fit on a recruiting team can be quite different from fundraising, retail, politics, and the other roles. Look for patterns among the backgrounds and personalities of the people who’ve succeeded on your team. These attributes codify your culture as it relates to hiring. Make these attributes a requirement for every person you hire. The verbal skills of people from these 6 roles tend to be above average. Don’t let them talk themselves into a job on your team. Leaders who do frequently regret these hires. Instead have candidates show you (by performing sample work in an interview) that they possess the transferable abilities and traits required for success. Nothing kills a new hire quicker than unclear expectations. Required daily activities is a repeat offender. Too many people coming into recruiting don’t understand the sheer volume of work required on a daily basis. During interviews make clear the amount of calls, documentation, interviews, e-mails, paperwork, and other activities that come with the job. But don’t leave it at that. Include these expectations in writing and have the candidate sign-off their acknowledgement. This will scare off some people, but better that a glimpse of reality end a future bad hire than having to terminate someone for real. 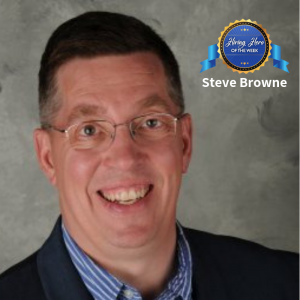 If we could clone a Hero of Hiring, Steve Browne would have to be at the top of the list. 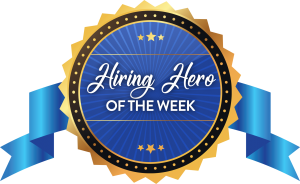 Steve is the Vice President of HR at LaRosa’s, Inc. What makes him worthy of being the Hiring Hero of the Week? Steve spends his days positively impacting those around him. When I get the chance to eat at a LaRosa’s pizzeria, I experience Steve’s influence in the quality of the people who work there (plus the pizza is amazing). Everywhere you look, be it online or at an HR event, Steve is there, supporting and guiding and cheering on the community. If that weren’t enough, he serves as a Director-at-Large on the SHRM Board of Directors and is the author of HR on Purpose: Developing Deliberate People Passion. Thank you Steve for the heroic work you do every day! P.S. Steve is very active on social media. Follow him on Twitter and LinkedIn. This week’s Hero of Hiring will come as no surprise to those who know him. Mike Lejeune, President of Lighting the Path, sets an example daily of what it means to serve those around him. 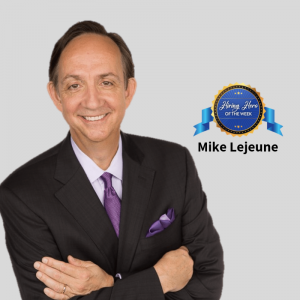 When I asked Mike to describe his work he said, “My path is to inspire, to ignite passion, to raise the bar of what we expect of ourselves in recruiting as leaders, recruiters, and business development specialists. We make a difference when we do more than serve—lives change by how we show we care.” And what a difference Mike has made. 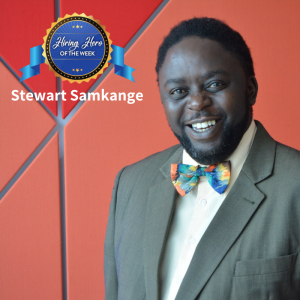 He’s mentored hundreds of professionals, helping them climb the corporate ladder and open their own search firms. Mike has also helped establish industry standards, including his work in creating one of the first accreditation programs for recruiters and the development of the extensive curriculum he uses in his work. Thank you Mike for the heroic work you do each day! Be sure to follow Mike on Twitter and LinkedIn. A baking mishap reminded me of a common mistake in recruiting. The baker, my cousin, decided to take some liberties with a bread recipe. Instead of measuring the ingredients, she eyeballed it, adding generous portions of her favorites. Then she decided to knead the dough for half the amount of time called for in the recipe. The result—a chewy gritty lump that tasted nothing like bread. Baking is a science. Follow the recipe and you’ll get a positive result. The same is true in recruiting. There’s a science to getting a good result. Skip a step or fail to follow a proven process and you end up with lackluster candidates and unfilled jobs. Yes, there’s an art to being good at recruiting, especially when it comes to the day to day aspects of the job, but that never outweighs the importance of the strategic ingredients required for success. 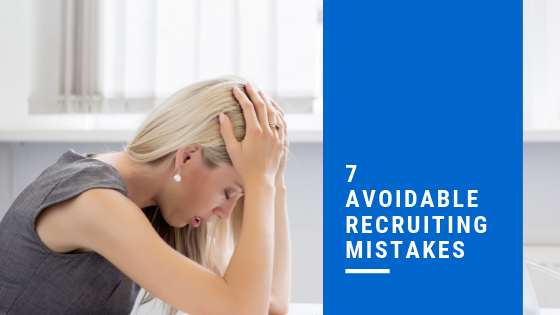 Here are seven frequent recruiting mistakes, and how you can avoid them. This first mistake is the most common. Many companies aren’t drawing in enough quality candidates, blaming the skills shortage as the problem. Some organizations draw in too many people who are underqualified, typically as a result of an unhealthy reliance on automation. Both of these extremes make recruiting labor intensive and filling open jobs a challenge. Generating a continuous supply of top talent requires leveraging all eight talent streams. Organizations that maximize all eight recruit faster, fill positions more efficiently, and effortlessly create pipelines of top talent for future openings. It’s common to throw everything but the kitchen sink into your hiring criteria. Making a quality hire is vital and starts with deciding who you’ll select. Unfortunately, the extreme importance of hiring right the first time has led leaders to be overly restrictive about who they’ll consider for a job. This limits the talent pool and keeps positions open for a long time. There’s a simple way to create accurate hiring criteria—seek proof. Review all of the people who’ve succeeded in the role. Look for the patterns among their skills, experiences, and personality traits. Make those your hiring criteria and leave the kitchen sink where it belongs. Falling in love isn’t just the plot line in romantic movies, it’s why the recruiting process in many companies becomes a drama. It often plays out like this…a superb candidate is found for the job, someone you fall in love with. “She’s the one,” you say. As a result, the recruiting effort comes to a screeching halt. When it turns out she isn’t the one, a mad dash ensues as you scramble to find more candidates. Most recruiters have a preferred stream of talent. For many, it’s referrals. They see referrals as the gold standard of recruiting, believing that this is the best way to find high quality people. While it’s true that referrals are gold, it’s just one of the eight streams of talent. Some of the streams provide overlapping access to the same candidates. However, no single stream can draw in all of the available quality people. That’s why it’s important to keep tapping into all eight. It’s not if there’s going to be a job opening, but when. That’s why the most successful organizations plan for the when. How are these companies planning for the inevitable? They’re shifting from the old way of hiring (keeping a job open until the right person shows up) into the new way of hiring (lining up talented people and waiting for the right job to open). They start with one core role, filling currently open positions and cultivating talent for when that job opens again. Then they move on to the next role. And then the next. And then the next. The majority of job listings read like typical ad copy. That’s why these posts fail to hold the interest of top talent. The mundane content creates a negative first impression, repelling quality candidates. What kind of content captures and keeps attention? Details about how working in your organization has improved lives and careers is a great place to start. Combine that with eye-catching delivery methods, such as video, gifs, or infographics, and you’ll attract and keep the interest of top talent. You can stop the insanity by regularly questioning each step of the recruiting process. Consider why it’s done that way. What results are being achieved? How can you could improve that result? In what ways you could streamline each step of the process? My cousin threw out that gritty lump of so-called bread. The next batch was superb because she followed the recipe, avoiding her past mistakes. You can do the same when you’re recruiting. Eliminating these 7 preventable errors will allow you to source top people who will become superb new hires. It’s been said that numbers don’t lie. 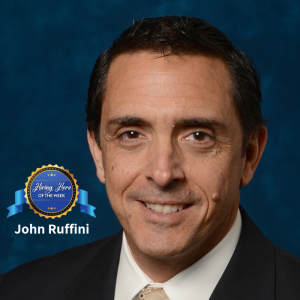 That’s certainly true when it comes to this week’s Hero of Hiring John Ruffini. John is the author of Money Makers: Proven Ways to Increase Sales and Productivity in the World of Professional Recruiting. He’s also the Vice President, Professional Development for HealthTrust Workforce Solutions in Sunrise Florida. John has helped thousands of recruiters improve their ability to impact candidates and employers. These recruiters have shaped the careers of tens of thousands of people who, in turn, have helped their employers create billions in revenue. Thank you John for the heroic work you do each day! P.S. Be sure to follow John on Twitter and LinkedIn. 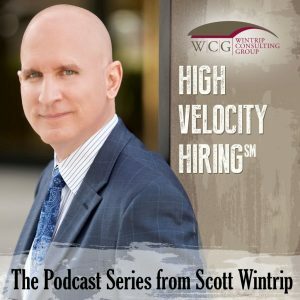 If you want to achieve better outcomes as a recruiter or if you lead a recruiting team and want them to accomplish more, this episode is for you. You’ll take away a simple approach that’s helping leaders and their teams surpass their goals quicker than ever.